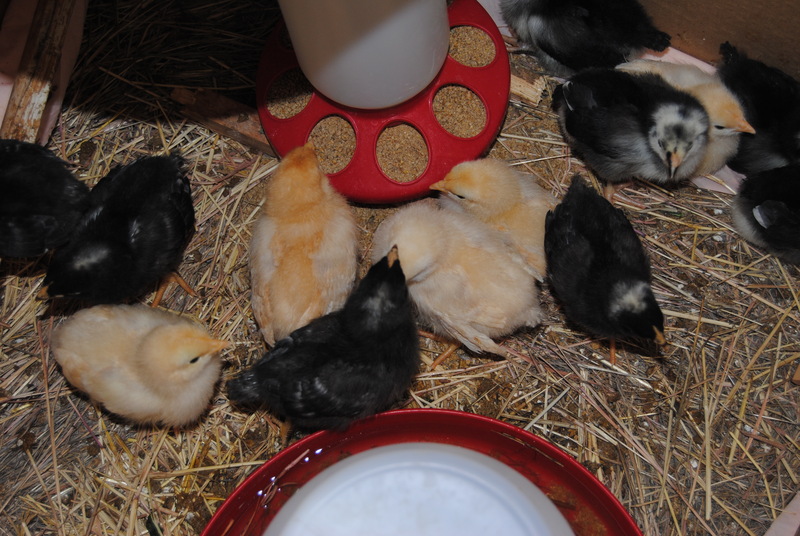 The sweet little chicks aren’t very little anymore. They are growing faster than anything I’ve ever seen. I don’t know if you can tell the difference in their size between the first and second picture, but it’s quite substantial in “real life”. The first picture was their first day with me, the second was taken this week. Here’s another picture for comparison. 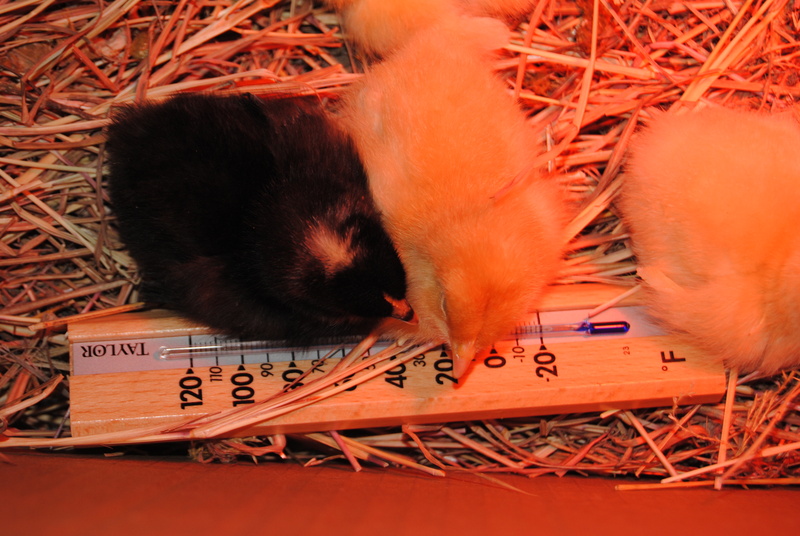 Here are two of them lying on a thermometer in the very corner of the box. The first one was taken when they were a couple of days ago. The second one was taken a couple of days ago. You can barely see the thermometer. Two of them almost cover it completely now. 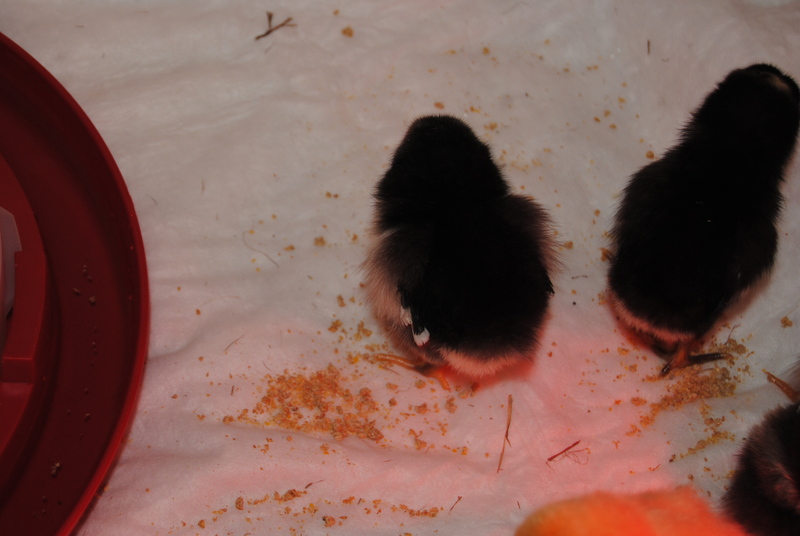 It’s silly I know, but I am plumb smitten with their new tail feathers. At first they just had little rounded butts, but now these cute tails are emerging. Not only are they growing, they are gaining some serious confidence and boldness in their flight ability. 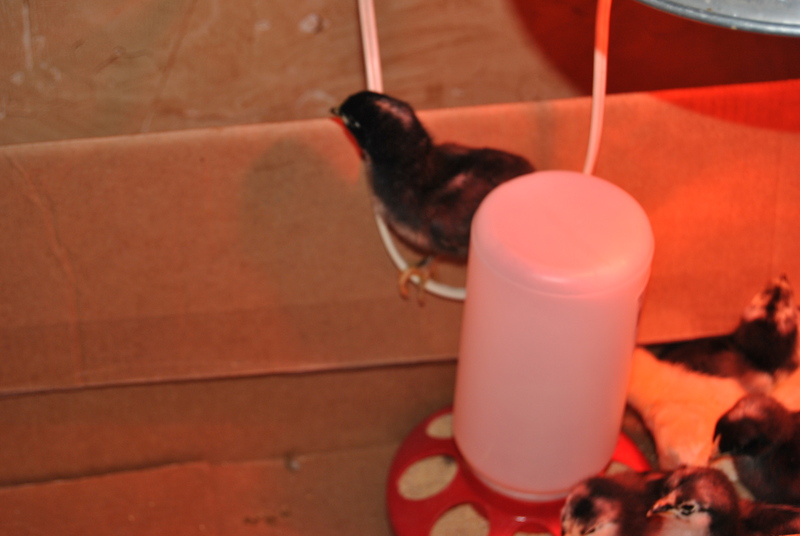 I created a small perch for them in the box, which was probably a big mistake. But, thinking like a chicken, I thought they would like to roost on something. 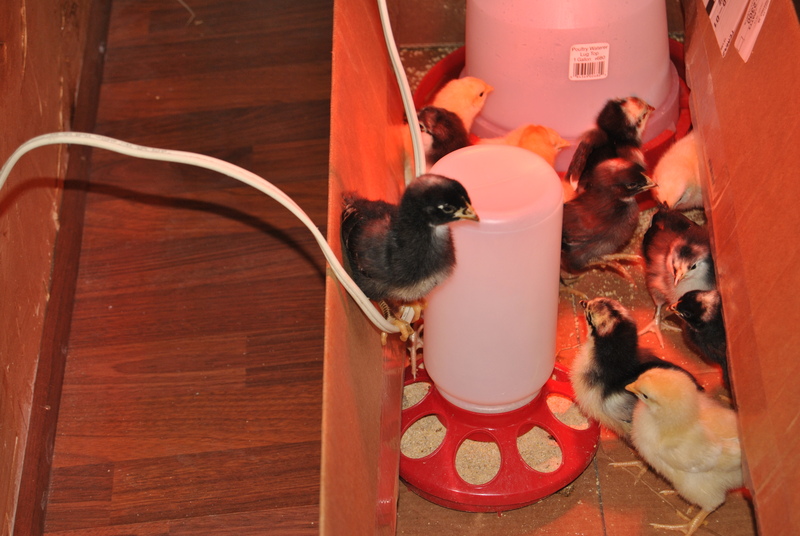 The perch serves the purpose well and also adds some extra height so they can fly to the top of the feeder and waterer. Once there, they strain their chicken necks as far as they can to look out. They want freedom! The other day, I temporarily stored them in a smaller box while I carried their larger box outside to replace the straw. When I returned, here was this booger checking out the view from the cord of the heat lamp. Jason called me the other day to report that one of them flew to the top of the feeder and then managed to fly to the edge of the box and perch there. I wish he would have gotten a picture but he didn’t. We had to pull the box flaps up and tape them so they have more of an obstacle. I only hope they don’t conspire to use their perch as a pole vault and high tail it out of there. I’m currently on the lookout for a window screen to put over the box to keep them in. 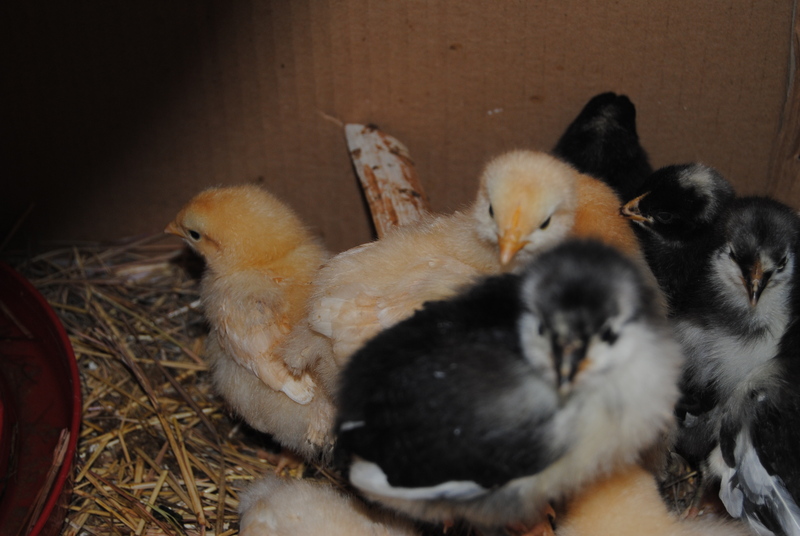 These breeds of birds I purchased, (Buff Orpington, Barred Plymouth Rock, and Australorp), are dual purpose birds. Meaning they are good for both eggs and meat. I might wring their necks and fry them up if the notion strikes me. But it won’t. Not to worry. 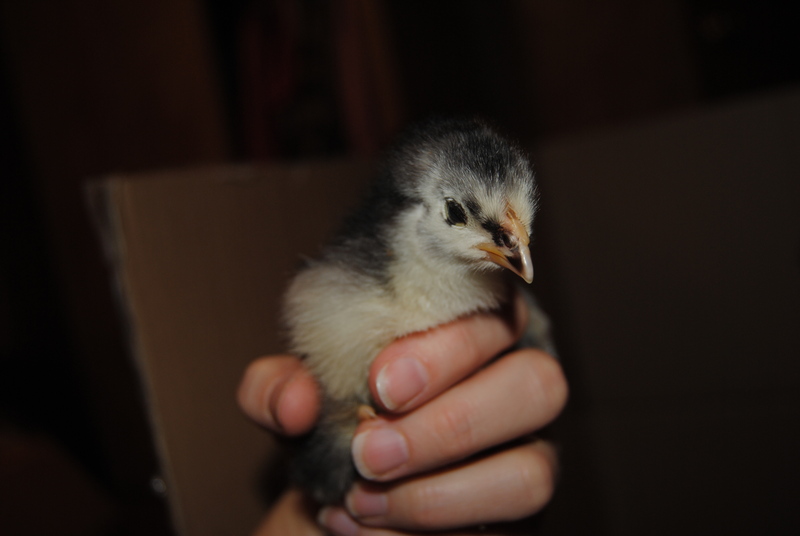 They are heavy bodied birds and will weigh about 7 or 8 pounds full grown. They shouldn’t be able to fly too high because of their heavy bodies, so I don’t think I’ll need to clip their wings. Thank goodness. We are enjoying these gals and spend much of our time sitting on a stool peering into their box watching their antics. 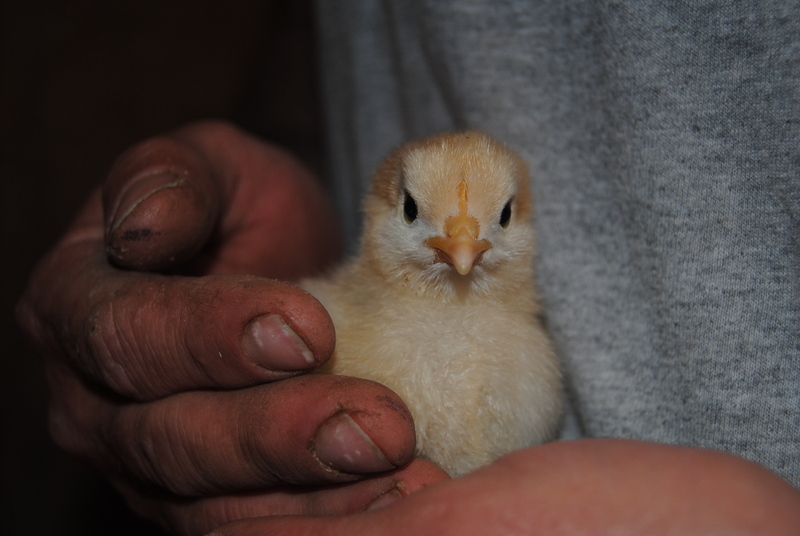 Here J-Dub holds a sweet baby chick in his rough, calloused hands. This picture is so precious to me. I could probably write a whole blog on it. I agree wholeheartedly. That last picture is worthy of an entire post. I hope to read it one day. 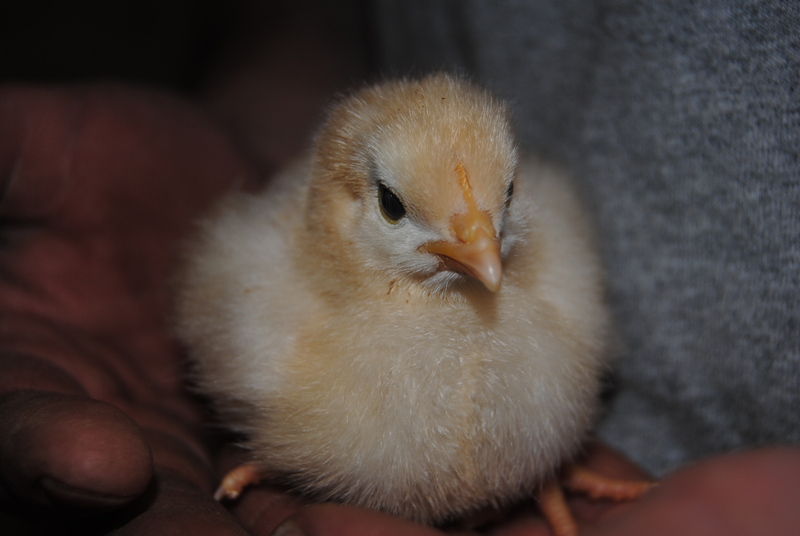 It is exciting to ‘watch’ the chicks grow. I can already hear the sizzle and smell the eggs frying on the griddle. 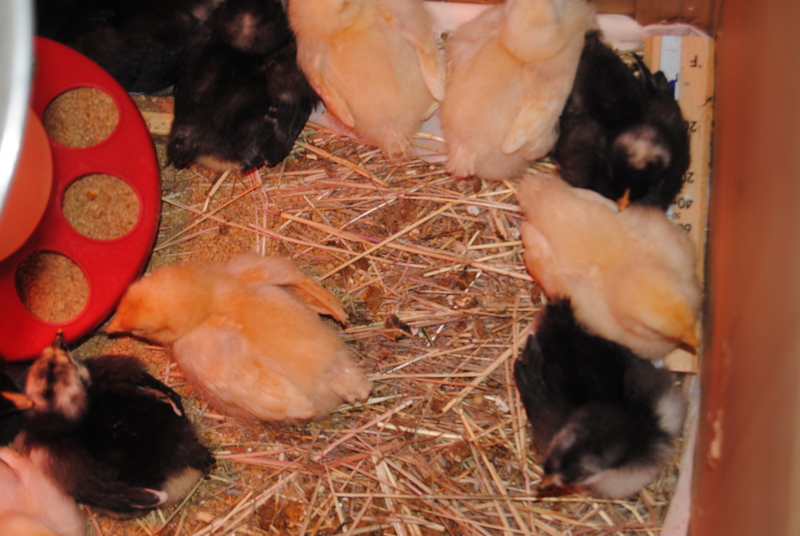 I don’t think these chick will ever live in the chicken coop, their momma will miss them too much. I can picture them all perched on the back of the couch, while you and Jason watching TV with one in each in your laps. LOL! Totally awesome! Can’t wait to see the little perties!! Mia and I will be over to hang. Maybe today if you don’t have plans. SO adorable! I want chickens, too!